Also known as ringtail cats, ring-tailed cats, miner's cats, or marv cats, ringtails are actually members of the raccoon family, native to arid regions of North America. 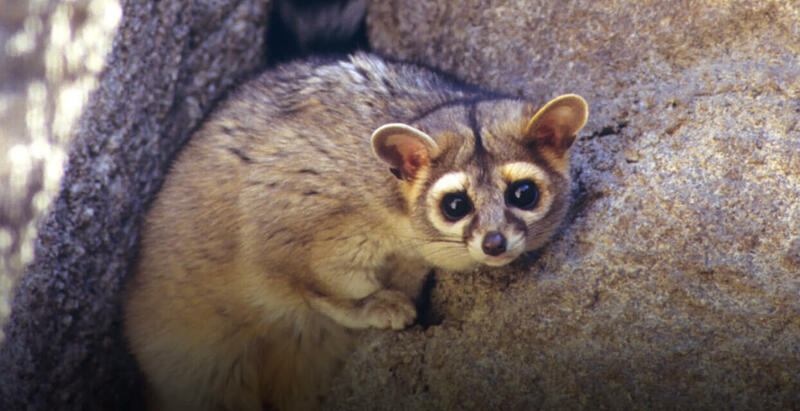 Despite the fact that ringtails are widely distributed throughout the southwestern United States and Mexico, they have been little studied, especially in southern California. We do know that they are solitary omnivores that forage primarily at night. They play an important role in the ecosystem as prey for larger predators such as great horned owls, coyotes, bears, and bobcats. Ringtails also serve as predators of a variety of arthropods and small mammals, and as seed dispersers. Our Recovery Ecology researchers, in collaboration with our partners, are studying ringtail diets across seasons to examine the relationship between food selection, space use, and road mortalities. Medium-sized predatory mammals known as mesopredators are the most common type of vertebrate to be killed by vehicle strikes and research has shown that these road kills most often occur in identifiable “hot spots” along roadways. Omnivores are more likely to be struck by vehicles on roads than other types of mammals, most likely because of their limited speed and how they search for food. Ringtails have large home ranges and are commonly found dead along rural highways in eastern San Diego County. To mitigate impacts on ringtail populations and reduce vehicle-associated mortality, we are working with our partners on a GPS telemetry study to better understand their behavioral ecology and movement patterns. Habitat fragmentation and degradation can lead to indirect effects on body condition, disease incidence, and overall health. Health assessments can provide important early indicators preceding population decline and give us additional insight into causes of decline. As we begin to outfit wild ringtails with GPS collars, we will also take the opportunity to collect data on a variety of health parameters. Ultimately, we hope to determine whether wildlife corridors are a viable management option for this species.